End Gang Life was created to be an emotional and visually impactful anti-gang initiative that uses engaging and powerful imagery and language that speaks to people and will hopefully give youth a fresh perspective on what gangs really are, give communities a rallying point around which they can mobilize against gangs in their neighbourhoods, and make gangsters pause and have a second thought about their life choices. The program material complements other CFSEU-BC engagement initiatives and supports other government and police gang prevention and awareness initiatives. 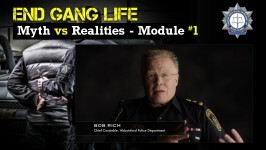 End Gang Life uses video in a variety of ways to give youth a real perspective on Gang Life. The short videos feature interviews with parents who’ve lost children to gang violence, former gangsters, and police officers. The Understanding Youth and Gangs booklet will be beneficial to parents by helping them to learn and recognize the signs of potential gang involvement in their children. The End Gang Life Posters is part of an ongoing public outreach effort to bring attention to gangs and stimulate discussion about gangs which demystify and eliminate misperceptions about gangs. A series of radio ads was created and the radio PSA’s will be distributed to every radio station in BC. They are also available on iTunes and Soundcloud. They see gang members driving expensive cars, wearing expensive clothes, and are inundated with images in the media, movies, and television that propagate many myths about gangs and gangsters. This provincial anti-gang campaign is deliberately edgy and thought-provoking content, meant to defy convention and evoke controversy and start conversations. End Gang Life consists of six short videos, six posters, and three radio PSA’s. The videos, which have been designated as “Public Service Announcements” by the Television Bureau of Canada, will be distributed to every television outlet in British Columbia. Similarly, the radio PSA’s will be distributed to every radio station in BC. The posters will be distributed both in hard copy and digital format to every media outlet in BC. All of the products will also be made available to every police agency, RCMP detachment, community groups, schools, etc throughout the province. This campaign is part of an ongoing public outreach effort to bring attention to gangs and stimulate discussion about gangs which demystify and eliminate misperceptions about gangs. Throughout the campaign everyone from youth, parents, siblings, peer groups, members of communities across BC, and gang members and their friends and families will be targeted. EndGangLife.ca aims to become a resource vital in education and prevention.